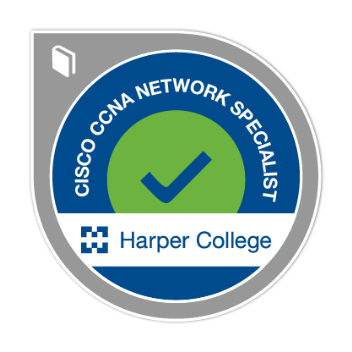 Cisco CCNA Network Specialist digital badge earners understand standard networking devices, terms, and concepts. Participants demonstrate the ability to select, connect, configure, and troubleshoot Cisco switches and routers, as they are commonly used in small to medium-sized networks. Badge earners know how to install, operate, configure, and verify a basic IPv4 and IPv6 network, including configuring a LAN switch, configuring an IP router, and identifying basic security threats.